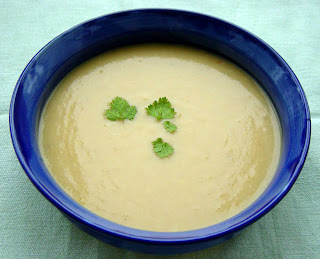 I seem to use parsnips a lot for soups during the winter – their sweetness seems very comforting. This is a really easy soup, the only trick is to use the right amount of lime to get the balance of sweet and sour just the way you like it. Fry the bacon briefly with a splash of olive oil in a large frying pan until some of the bacon fat is released and it starts to take on a little colour. Remove the bacon and set aside but leave the fat in the pan. Add the onion to the pan, with an extra splash of oil if necessary, and fry gently for 7 or 8 minutes until it begins to soften. Add the garlic and ginger and continue frying for another 2 minutes. Stir in the sugar and chilli flakes. Pour in the marsala and continue cooking, stirring all the time, until the marsala has almost disappeared. Stir in the parsnips and potato. Put the bacon back in the pan, pour over the stock and add the maple syrup. Season with a generous grind or two of pepper and simmer gently, uncovered, for 25 minutes or so until the vegetables are fully softened. Allow the mix to cool a little, then liquidise, adding a little more stock or water if the soup is too thick. Adjust the seasoning and add the lime juice a little at a time until you get the balance of flavour the way you’d like it. The January In The Bag challenge on A Slice of Cherry Pie reminded me of this dish since it just happens to contain all the ingredients in the bag – lemons, garlic and sesame seeds. I haven’t made this for quite a while - I think I might have bored everyone by making it too often a few years ago. Anyway, I dug out my scruffy notes from back then and I’ve decided that I still like the dish. The theme of the challenge was actually “Detox January” and I’m not so sure that this recipe is detoxing, but it is comforting on these cold January nights. I normally serve this with couscous (possibly flavoured with lemon or with some roast veg added) but it’s also good wrapped up in flat breads and served with a side salad. In a bowl, mix the cumin, coriander, paprika and ginger with the oil and toss the cubes of meat in the mixture until they are lightly but thoroughly coated. Brown the lamb lightly in a frying pan big enough to hold it all in one layer. Add the onion and fry for another 4 minutes, stirring frequently. Add the garlic and continue frying for another 2 minutes. Add just enough hot water to cover the meat, partially cover the pan and simmer very gently for 1½ - 2 hours, stirring occasionally. Don’t let the meat dry up entirely - top up with a little water if necessary. At the end of this time the meat should be very tender and the water should have largely evaporated. Add the apricots, dates and preserved lemon. Place the sesame seeds in a dry frying pan over a low heat, keep the seeds moving and when they start to darken slightly, add them to the meat mix. Pour in the honey, half of the lemon juice and the pomegranate molasses. Add enough water to create the amount of sauce you’d like – less if you’re serving in wraps, more if you’re serving with couscous. Cover and simmer very gently for another 30 minutes. Adjust the seasoning and add as much of the rest of the lemon juice as you think it needs. This makes around 7 or 8 portions, depending on the size of the veg you use. In an oven tray coat the butternut squash pieces lightly with olive oil and sprinkle with salt and pepper. Roast the squash until it’s fairly soft but not too charred at the edges – around 30 minutes at 180°C should be about right. In a large frying pan soften the onion with a small amount of oil, adding water to keep it from burning (and to keep the fat down). Add the garlic and soften briefly. Pour in 1½ litres of the stock, add the sweet potatoes and bring to a simmer. Add the apples after five minutes or so. 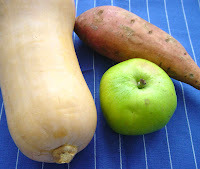 Once the sweet potatoes start to become tender, stir in the roasted squash. When all the vegetables are nice and soft add the sage, 5 spice, chilli flakes, a squeeze of lemon and some black pepper and simmer for another few minutes. Allow to cool a little and liquidise in batches. Adjust the seasoning, add more of the stock if too thick and a touch more lemon if it seems to need it. There are plenty of different bobotie recipes around but here’s another one anyway. I prefer it lightly spiced with a fruity taste and a very eggy topping. Definitely comfort food for these cold, dark days. Preheat the oven to 190°C (for a fan oven- a little hotter otherwise). In a large frying pan, fry the onion and carrot in a little oil until it has started to soften (add water rather than too much oil if you’re trying to be healthy). Add the apple and garlic and continue frying for a couple of minutes. Add the mince and continue frying for a few more minutes until the meat has taken on colour all over. Take the frying pan off the heat and stir in the breadcrumbs. The mixture should now be relatively dry but not solid. Stir in all the rest of the ingredients (apart from the topping) and season with salt and pepper. Tip the lot into a fairly deep oven-proof dish. For the topping, beat the eggs and combine them with the milk. Pour this mix over the top of the mince. Put in the oven for 30 minutes until the topping has browned. Serve either with rice or a salad or maybe just with a big spoon. I really like pain d’épices, especially for breakfast, but there are huge variations in the texture and taste depending on where you buy it or whose recipe you follow. I like it soft inside, very full of honey and not heavily spiced. I've tried different techniques, flour combinations and flavourings and I've now arrived at this hybrid recipe that finally produces the kind of result that I've been looking for. With all that honey in the cake it should keep well but so far it's been eaten too quickly to confirm that. Incidentally, my favourite commercially produced pain d’épices was sold by the apiculteur Marc Fourneaux in Dieppe market on Saturday mornings, and hopefully still is – though I haven’t been back there for a while. Unless you have a silicone loaf tin, grease and line a 1 Kg (2 lbs) loaf tin with baking parchment – be thorough, this is a very sticky mix. Preheat the oven to 180°C (for a fan oven, a little hotter otherwise). Sift the flours, baking powder and ground ginger together. Pour the milk and honey into a fairly large saucepan and put them on a very gentle heat, stirring a lot until the mixture comes together and flows freely. Add the butter and sugar to the pan and keep stirring until the sugar has dissolved and the butter has just melted. Take the pan off the heat (it shouldn’t be too hot, so let it cool a little if in doubt). Stir in the orange zest and the almond butter followed by the beaten egg. Gently work in the sifted dry ingredients. Keep stirring until you have a smooth batter – at least as smooth as you can reasonably make it – and pour into the prepared tin. This amount of mix may be a little generous for the tin – you’re aiming for about ¾ full. Don’t overfill the tin, a bit of a bulge is good but not too much. Put the tin in the oven but make sure you’ve got some foil ready. Cover the tin with some foil when the top of the cake starts to take on an even light brown colour after about 15 minutes. The high sugar content will mean that the top will tend to go a dark brown but it needs to be covered to prevent it becoming too scorched. The cake will take around 45 – 55 minutes altogether – test that a skewer comes out clean. Let the cake cool for 10 or 15 minutes in the tin before turning out (carefully – it might be fragile) and cooling fully on a rack (preferably non-stick). I really like slow cookers - in fact I've got two of them (it's a long story). But I’ve found that you can’t simply take a standard casserole recipe, shove it in a slow cooker and expect perfect results. They do need a little tweaking at the very least. But they do work really well for some types of casserole and I think game is one of the best meats for a slow cooker. Put all the marinade ingredients together in a bowl and add the carrots, onion and venison. Mix well, cover and leave in the fridge overnight. The next day, preheat the slow cooker. Drain and reserve the marinade, discarding the orange peel. Pick out the meat, dry it off a bit with some paper towel and brown in a little olive oil – it will probably be necessary to do this in batches. Transfer the meat to the slow cooker. Add the carrots and onion to the pan and fry it for around 5 minutes or so. Pour in the reserved marinade and bring to the boil. Add the chopped tomatoes and tomato purée. Bring back to the boil and pour into the slow cooker. There should be enough liquid to just cover the meat and carrots – if not, add a little stock or water. Stir in the redcurrant jelly or cranberry sauce (I used cranberry sauce because it’s that time of year and I'd already made some). Make sure everything is well mixed and cook for around six hours, although the time needed will depend on the type and size of the slow cooker. Finish by adjusting the seasoning and adding a squeeze or two of lemon juice. If the casserole seems a little too thin then thicken with a little cornflour. This will either work as a casserole served with mash or as a pie filling. Since the casserole is low fat, using a low fat pastry makes a sort of sense.